Ride across the rolling landscape of the northern Alentejo on a guided bicycling tour, visiting some of the region’s oldest towns…and at least a dozen ruined castles. My wife and I will be leading small groups (maximum of 10 people) to explore some of the quietest and most fascinating countryside anywhere in Portugal. Starting in the ancient city of Évora with its UNESCO World Heritage architecture, we’ll guide you on a circuit that runs along the border with Spain and up into one of the quietest corners of Portugal before looping back south again. Along the way, we’ll ride along the banks of the Guadiana river, explore sleepy villages, stop in historic towns and visit castles ranging from dramatic hilltop eyries to some of the largest and best-preserved 17th century fortifications in Europe. “Everything was perfectly planned with great routes, delicious food and drink, awesome castles and sights everywhere! 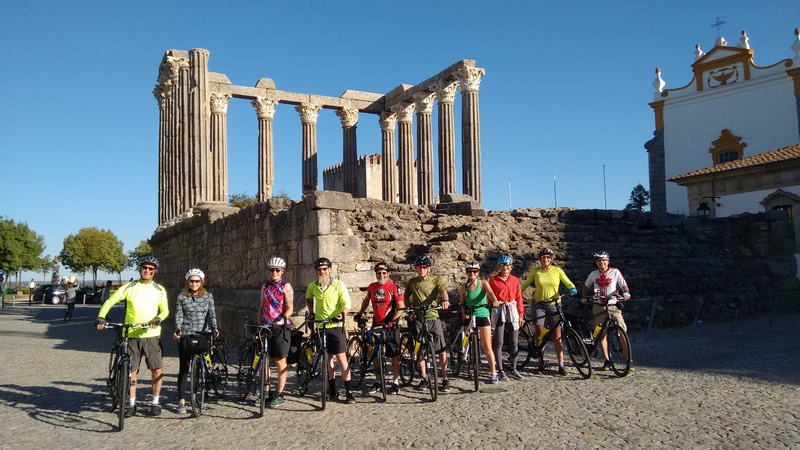 “I would highly recommend this group and biking in Portugal to anyone.” Amy Hillenbrand, Colorado. 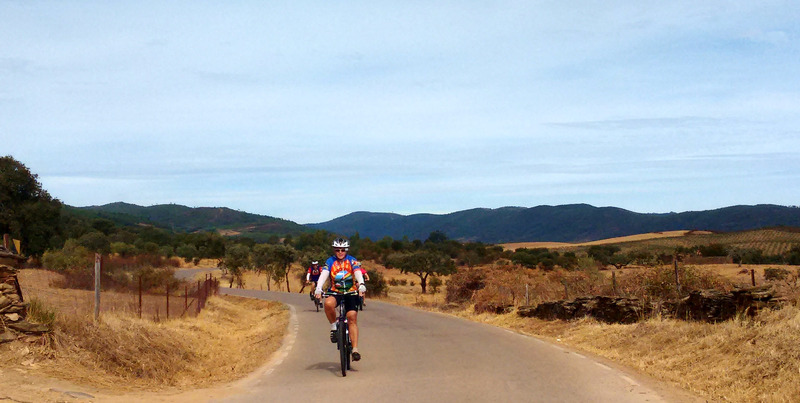 The Alentejo offers some of the best terrain for touring cycling anywhere in Portugal. There are few big hills or steep inclines but a rolling landscape that stretches off to distant horizons. 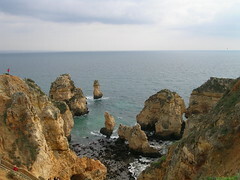 This is one of the least-populated parts of Portugal but dotted with towns and villages with a rich past. From megaliths to Roman temples and medieval castles to renaissance mansions, there’s plenty of history to discover. Palaces, convents and castles hint at the region’s former wealth, while a string of once-mighty fortresses guard its eastern border. Agriculture is still one of the few major industries and you will ride for hours across an open landscape dotted with cork oaks, olive plantations, the occasional vineyard, and vast swathes of pasture. Birdwatchers will also be able to keep their eyes peeled for a wealth of avian life – from eagles to bee-eaters and storks to hoopoes. Ranging from around 45-75km (28-46 miles), the main riding days present no major challenges for anyone who is reasonably fit and used to cycling. Note: Riders must be reasonably fit and able to cycle 60-plus kms on consecutive days. This region sees some of the highest summer temperatures in Portugal and spring (late February-early May) and autumn/fall (late September-early November) tend to be the best times for biking. Both spring and autumn can see some wet days (mainly heavy showers rather than days of rain) but dry weather is much more likely. Whichever time of year you pick, you can expect plenty of sunshine and average daytime temperatures in April of around 16-26°C (60-80°F) and in October 18-28°C (65-82°F). The Alentejo generally looks a lot lusher and greener in the spring, with carpets of wildflowers stretching across its meadows, whereas the autumn can be hotter and drier. Please note: all pictures used on this page are from previous tours or are of roads/locations on the tour and taken on previous visits to the region. “Super fun vacation, riding on good roads with almost no cars…so well taken care of by Huw & Carolyn the whole time. 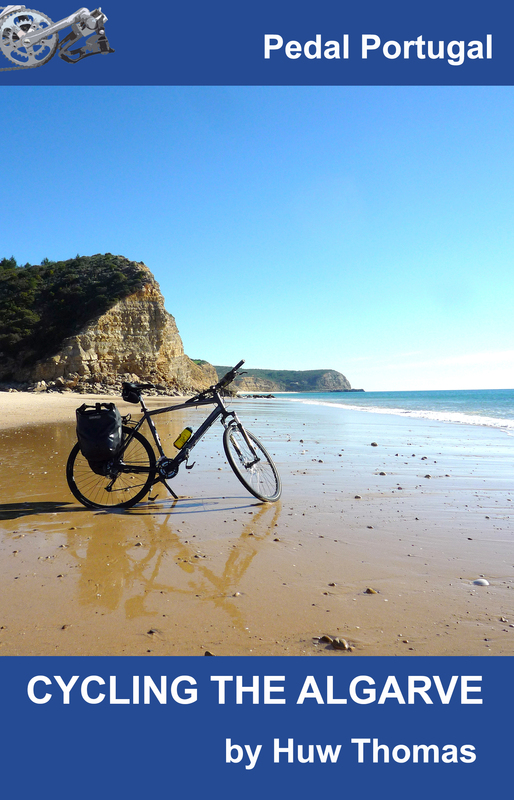 “We thoroughly recommend this bike tour to anyone who likes to ride free of gear, through rolling countryside, interspersed with interesting stops along the way.” Bruce & Jennifer Wilson, California. The tour explores the north-east corner of the Alentejo, skirting the Spanish border and visiting more than a dozen castles along the way before turning south-west to see more of the interior of this spectacular region. We will visit UNESCO-listed historic cities, near-deserted villages and charming old towns, bicycling across sun-baked countryside dotted with cork oaks and olive trees. Although not car-free, around 90% of the route is on quiet lanes and back roads where traffic is very light. There will be two rest days during the tour (with options for additional rides) in order to cater for a range of abilities and levels of fitness. 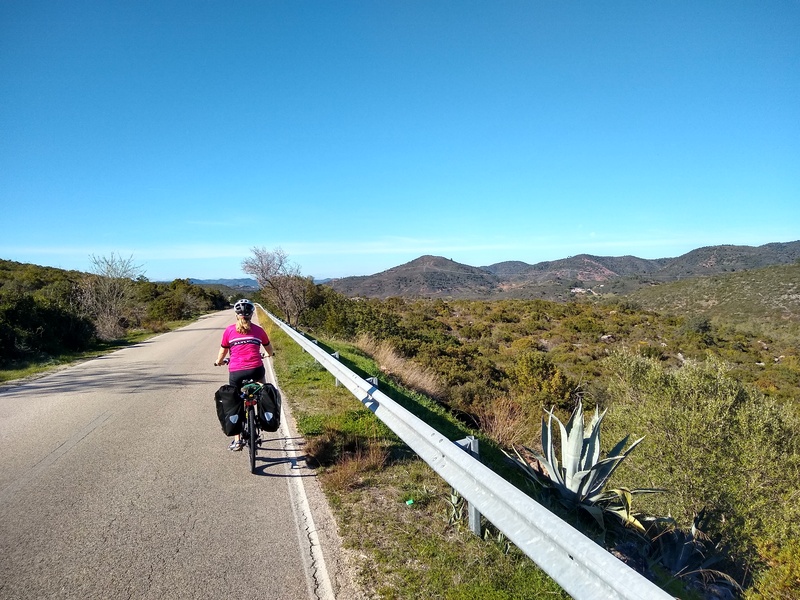 Day Eight: cycle out from Castelo de Vide and explore more of the area by bicycle, or have a day out of the saddle and wander the town’s cobbled lanes and go up to its impressive castle. 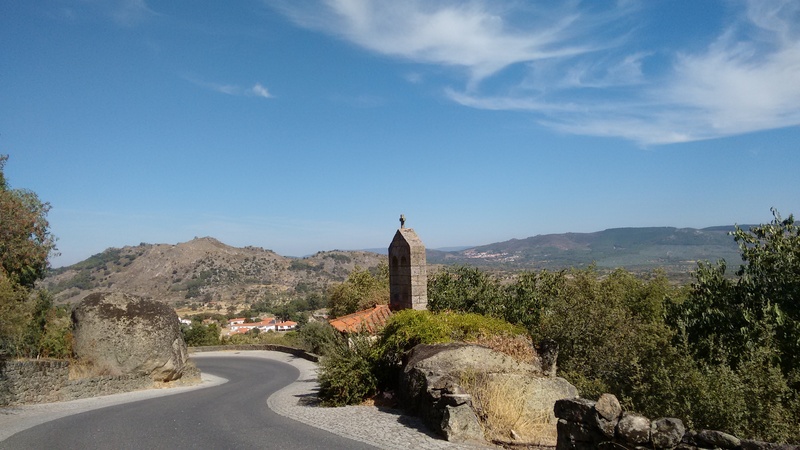 There are also options for longer walks, including up to Marvão. The tour costs €1,420 per rider – which works out at about £1,268 or $1,750 US at current exchange rates (February 2018). ***Transfers: We will book train travel between Lisbon and Évora on Day One or Twelve if required. We can also advise on bus and/or rail travel for any riders travelling on other days or from/to different destinations. Read what previous riders thought on our reviews page (scroll down to find comments specifically on this tour). You can also continue to the bottom of this page for more pictures from previous Border Castles trips.